The original name of the printer was VIC-1526 resp. 1526. Both printers MPS-802 and 1526 are identical except for the labels on the front and back. The device number is set to 4 by default. It can be changed via jumpers on the PCB from 4 to 11. 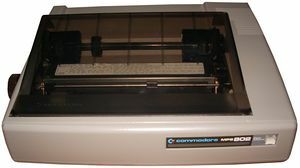 The Commodore printer CBM 4023 resp. 4023 is mechanically identical to the MPS 802, but has an IEEE-488-interface instead of the serial IEC-interface. For the MPS-802, two extensions are known. The first, called SUPER-ROM, was published in the German magazine 64'er. The MPS-802 has 9 needles, the hardware can operate only 8 of them. So there is also a little hardware modification necessary. In addition to some bugfixes the printer knows now 8 ESC/P-commands for graphic printing. The second one is the GRAFIK-ROM II and was available for 78,- DM. It contains support for 19 MPS-801 commands and 3 ESC/P commands for graphic printing.